Asbestos Management | First Environment Ltd.
Technical expertise to assist with the identification and management of asbestos containing materials. The Control of Asbestos Regulations 2012 require all Duty Holders to identify, record and manage any asbestos within their buildings. Usually this will start with a survey for asbestos containing materials. 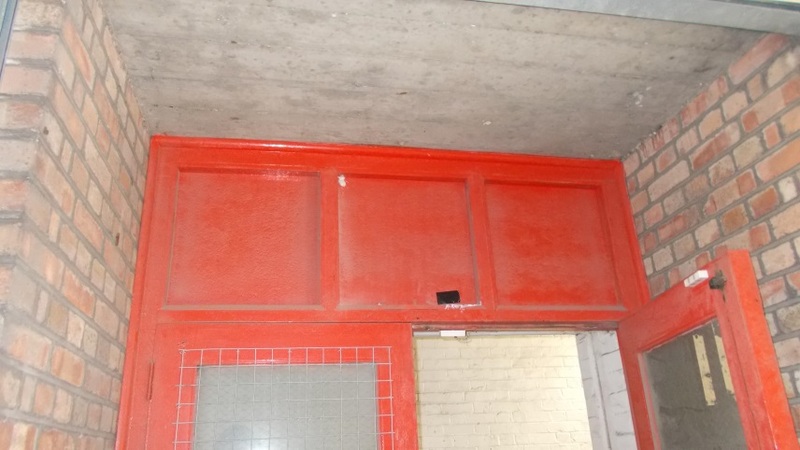 First Environment provides a range of asbestos related services providing the technical expertise to assist with the safe management of asbestos at your location. Our survey team have particular experience of complex industrial process systems and buildings including to the oil and gas, motor, aerospace and construction materials manufacturing sectors. First Environment holds UKAS accreditation to ISO17020 for undertaking Re-inspection, Management and Refurbishment and Demolition Surveys for asbestos in domestic, commercial and industrial premises. It’s the fibres you can’t see that if inhaled can lead to several asbestos related diseases. Past exposure to asbestos kills around 3,000 people a year and this number is expected to rise further. 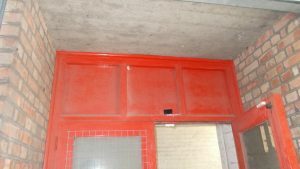 The exposure to asbestos for most of these cases will have occurred in the past, however, the potential for further exposure in uncontrolled situations still exists and controls are required to prevent this. 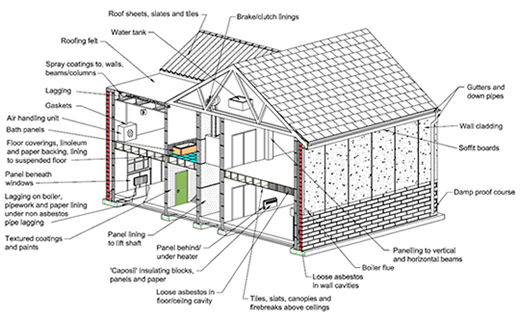 With well in excess of two thousand known applications asbestos is frequently encountered within buildings as the diagram shows. As a result many routine activities can bring workers into close proximity to asbestos containing materials. Often the material will be in a safe condition, however, where disturbed or in poor condition asbestos fibres can be released placing individuals at risk. Our consultant team hold qualifications to BOHS P402, P405 and higher and many years experience in undertaking surveys for asbestos in commercial and industrial premises. We have particular experience in refurbishment/demolition surveys in complex industrial environments which often provide the most challenging types of survey to undertake. First Environment does not undertake asbestos removal so survey activities are provided from a totally independent viewpoint. We work hard in the planning of surveys to ensure that all areas are accessible for survey so that assumptions and omissions are kept to an absolute minimum and fully justifiable. Once asbestos is identified First Environment’s service portfolio supports Duty Holders with the material assessment, priority risk assessment, asbestos management plans, labelling, training and re-inspection surveys required.